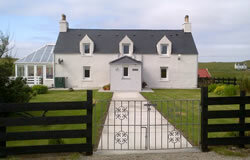 Cnoc nan Uan is a traditional croft house which was recently renovated to a high standard. We are situated in an area of natural beauty with sandy white beaches nearby. Approximately one mile away is the Balranald Nature Reserve where the RSPB have a visitors’ centre. The corncrake can be heard (and sometimes seen) on our croft. On arrival you will be welcomed with tea/coffee and some home baking. Our newly fitted guest kitchen/sitting room is very well equipped and you are welcome to use it during your stay. Facilities include microwave, cooker, washing machine, fridge/freezer, Freeview TV/DVD, iron and ironing board. Wi fi is also available. Our conservatory is ideal for relaxing in at the end of the day. You will enjoy the tranquil setting, you can watch the birdlife and may be able to see some beautiful sunrises and rainbows. Sky television is available in the conservatory. Cyclists are very welcome. In the past cyclists have used our grounds for camping. (See facebook page) We have ample space for tents at the front and at the back of the house. There is a toilet in the front porch for use during the night if necessary. Reduced rates apply for camping. Evening meals are available by arrangement. We cater for vegetarians and any other dietary requirements. Evening meal will be £25 per person for a two course. The bedrooms are warm, comfortable and relaxing. There is a Freeview TV/DVD and hairdryer in each bedroom.